I have just seen the programme for Wymondham Schools’ Cluster Great War Commemoration Day and what an exciting event it is going to be! 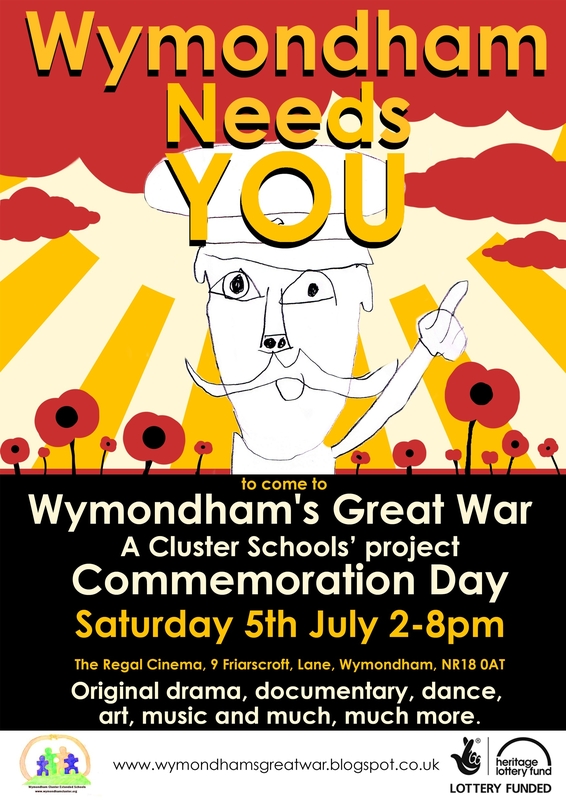 Held on 5th July from 2pm to 8pm at the Regal Cinema in Wymondham, the day will showcase the work done by schools in the Wymondham area to commemorate World War 1. On show will be a documentary film made by Robert Kett Junior School and animated films by pupils from Ashleigh and Browick Road Infants Schools who have worked with local animator Matthew Harrison (watch this space for some work the Library Service has done with Matthew at Great Yarmouth Library!). A series of live performances will also take place over the course of the day. Students from Spooner Row School will give a dance performance, whilst original music composed by pupils at Barnham Broom, Wicklewood and Wreningham primary schools will be played. There will be an opportunity for the audience to get involved with Chris Ellis leading a ‘sing-along’ to popular tunes from the First World War. Before the final act of commemoration at 7.30pm, students from Wymondham High School will perform ‘Wymondham’s Great War’, an original drama based on scripts written by pupils at Wymondham College and Wymondham High School. The music and sound that complements the play has been created by children at Branham Broom, Wicklewood and Wreningham. The prize giving for the Creative Writing competition that has been running as part of this project will also take place in the afternoon. Throughout the day there will be opportunity to take part in activities and games, and visitors will also be able to view some original sculpture inspired by War Memorials and created by pupils from Morley and Tacolneston Schools. This entry was posted in Events and tagged Ashleigh Infants School, Barnham Broom, Browick Road Infants School, Matthew Harrison, Regal Cinema, Robert Kett Junior School, Schools, Spooner Row School, Wicklewood, World War 1, Wreningham, Wymondham, Wymondham College, Wymondham High School. Bookmark the permalink.